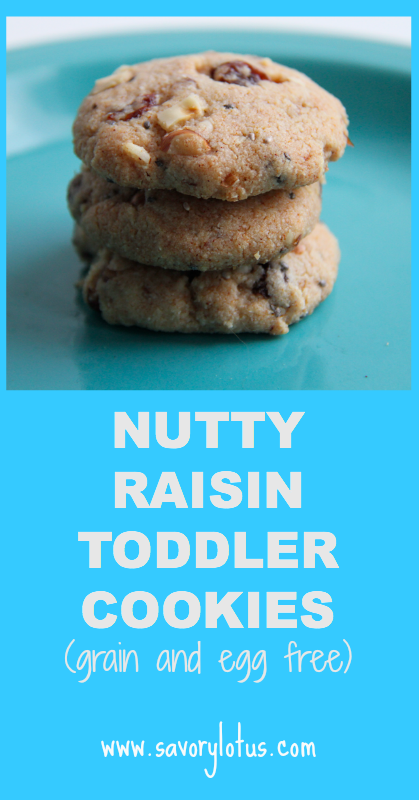 Want to make a cookie that you can feel good about giving to your little one? Frustrated by the amount of crap that gets put into children’s snack foods, even the “healthy” ones? Then these cookies are for you. I use THIS almond flour in my baking. It’s really fine and makes for really nice baked goods. And it’s the best deal around. I’ve seen almond meal sell for $10-12 a pound at the health food store. It’s a big bag (5 LBS) but I store half in the freezer and half in the fridge. I add chia seeds to my foods whenever I can. (LIKE THIS ) They are an amazing superfood. And I love to bake with coconut oil . It’s delicious, immune boosting, and helps to fire up your metabolism. I also soak and dehydrate the nuts that I use in baking to make them more digestible. Read more HERE about soaking nuts and seeds. No idea why they burned, did everything it says in the recipe. I will try that. Attempting to make them again now, hopefully it’ll work. Thank you. I’ve made them 3 times already and they’re totally delicious. The 350 temperature was the problem, I baked them at 275 for 12 minutes, then let them sit in the oven turned off for about 4 minutes more. That way they turned out perfectly every time. My last batch was doubled, in place of nuts I used hemp seeds and in place of raisins I used coconut flakes. 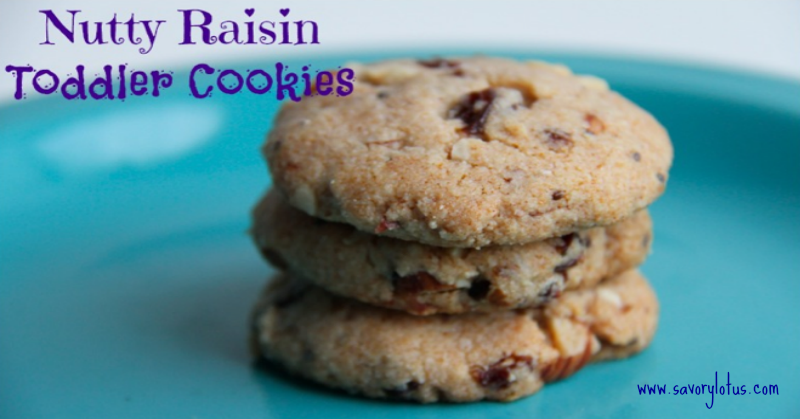 I also omitted chia seeds in my last batch and used cranberries in place of raisins in the batch before. I have to make double batch from now on because they’re gone pretty quickly. *All my ingredients were organic. I have been searching for a go to cookie recipe since going wheat/grain free (Wheat Belly) and these are it! 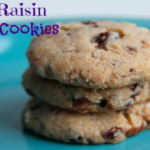 I do leave out the raisins and add sugar free chocolate chips and I use walnuts or pecans – love the texture. Just wondering about the nuts: you say to use soaked & dehydrated nuts for the 1/4 cup nuts added to the mixture, but the base of the recipe is 1 1/2 cups of almond flour, which is not soaked & dehydrated. Does it work to grind your own properly prepared nuts? 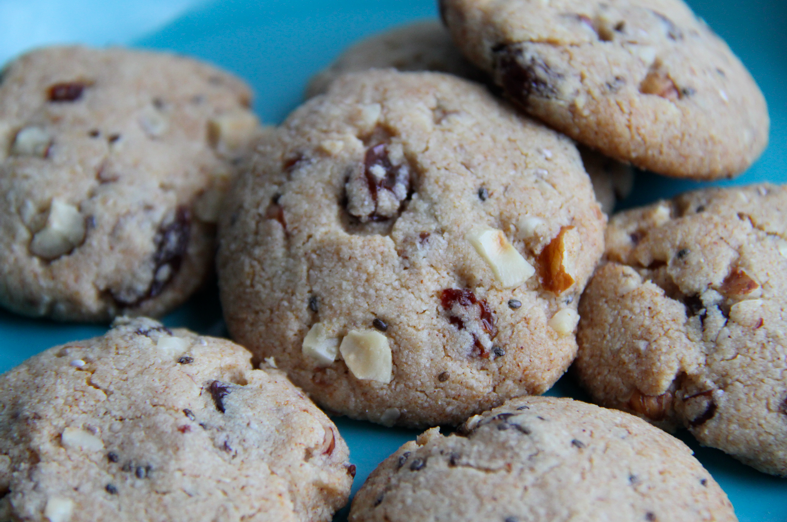 The almond flour that I use is not soaked and dehydrated, just the added nuts. 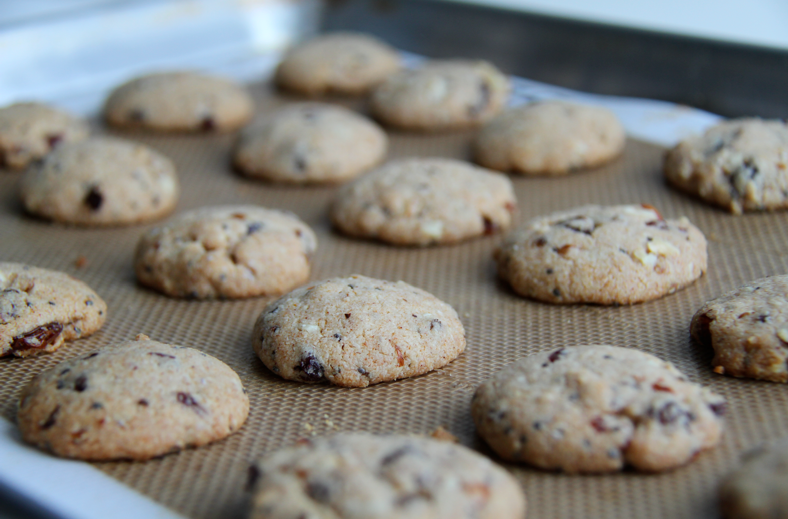 You could make your own almond flour from soaked and dehydrated almonds. I don’t use almond flour too much so I don’t make it at this time. I like the fine texture of the Honeyville brand that I use.